James Albert Ukawsaw Gronniosaw and Walter Shirley, 1725-1786, edited by A Narrative of the Most Remarkable Particulars in the Life of James Albert Ukawsaw Gronniosaw, an African Prince, as Related by Himself. 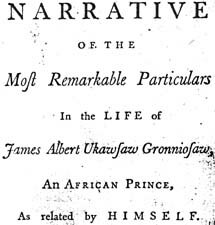 A Narrative of the Most Remarkable Particulars in the Life of James Albert Ukawsaw Gronniosaw, an African Prince, as Related by Himself. Bath: Printed by W. Gye, 1770. Perkins Library, Duke University, provided the text for the electronic publication of this title.